The standard FT817 Nickel Metal Hydride battery that comes with the radio doesn’t provide a lot of radio running time. The capacity of the standard pack that came with mine is 1400mAh and the pack itself weighs 203 grams. 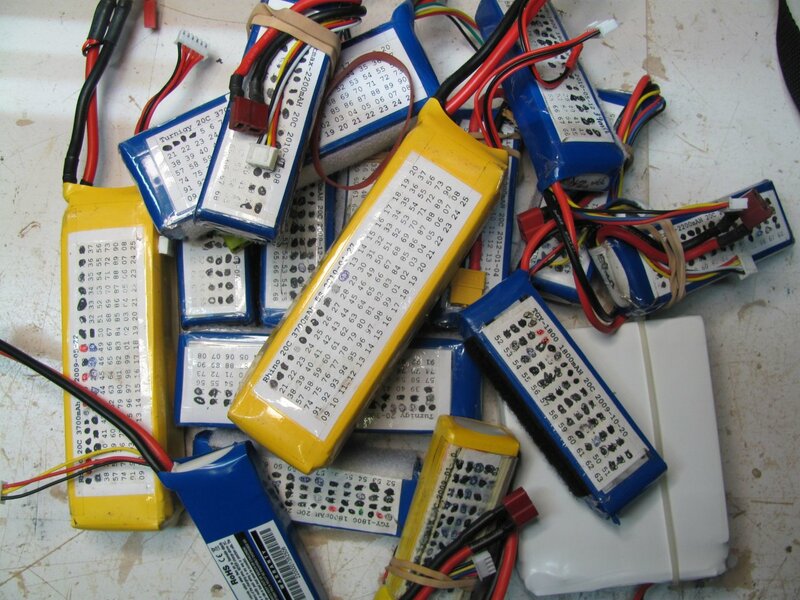 I use a lot of Lithium Polymer batteries for my radio controlled hobby and have been using Lipos as external power sources on the FT-817. Hobbyking have this Lipo pack that is a good fit inside the FT-817. The pack is a bit narrower than the original NiMh pack and about 50 grams lighter at 150 grams. The capacity at 2500mAh is significantly more than the original pack. The price is USD 15.99 plus postage. There are some things to take care of though with a Lipo pack. The cells must not be allowed to discharge below 3V per cell, in this case 9V at the pack. Discharging below these levels will irreversibly damage the pack. The cells should also be balanced charged. This means the cells must be charged so that they all receive an equal voltage. The cells must also be charged as current limited constant voltage. That is, the charge current must be limited to 1C or 2.5Amps maximum and the voltage limited to 4.2V per cell or 12.6V for a 3 cell pack. The charge voltage must not be higher than this or damage will result. Lipo packs also dont like trickle charge, a typical Lipo charger terminates the charge when the charge current falls to something like 5% of the C rating of the pack, in this case about 125mA. Fortunately, Lipo chargers are relatively cheap. Hobbyking has Lipo chargers from about USD 5.00! Here is a very low cost example although I would spend a bit more for a better quality unit. There are reasonable ones for about USD 20.00. One final thing, there was some discussion on the SOTA thread about the FT817 trickle charging the internal pack when it is turned on and powered from an external power supply. This will be bad for the pack if the external power is higher than 12.6 V. A suggestion was made to place a diode in series with the pack to stop any possibility of trickle charge. A 3 Amp shottky diode would work here such as an MBR360 3Amp diode. I was doing some tests with the FT817 using the internal Lipo battery the other night and was distracted by one of the kids with printer problems. You guessed it, I left the radio switched on and didn’t find out until the next day. Ordinarily this should have killed the Lipo pack, but to my suprise, I gave it a charge and then left the radio on for a few hours and the pack seemed to still have the original capacity. I think what saved it was the FT817 low voltage switch off. Just in case, I have enabled the power down timer on the 817 in case this happens again. Update> checked the low voltage switch off threshold, it is between 6.9-7.0V. For charging the pack I have left the existing standard balance connector on the pack and connected a JST two pin female socket for charging in parallel with the connector to the FT817 power. The JST connectors are common in RC equipment and there are charger adaptors for these. The FT817 uses a sniff of power when it is turned off (mine uses 0.12mA). If the radio isn’t going to be used for a while, I disconnect the battery as a precaution. Update 2012-11-15: Well, I soon got tired of opening up the hatch to recharge the battery and disconnect when not in use. I looked high and low for a DC connector that I could mount on the battery hatch and ended up using a common bulkhead DC connector with a 2.5mm centre pin. A slide switch was also installed to disconnect the battery. Both the switch and connector fitted in the gap between the battery and the side wall of the battery tray. I saw an arrangement similar to this on a chinese website that makes accessories for the FT-817. It worked out reasonably well and I added a 2Amp compact fuse in series with the Lipo in case something went wrong. The connector on the battery is a JST type from Jaycar. In practice the 817 draws up to 2Amps, but a 3 minute carrier at 5W didn’t pop the fuse. It will probably go when I am on a remote hilltop somewhere! Later on the fuse blew due to mishandling the battery during charging, so the fuse was replaced with a Polyswitch resettable fuse, as the standard fuse was not field replaceable. 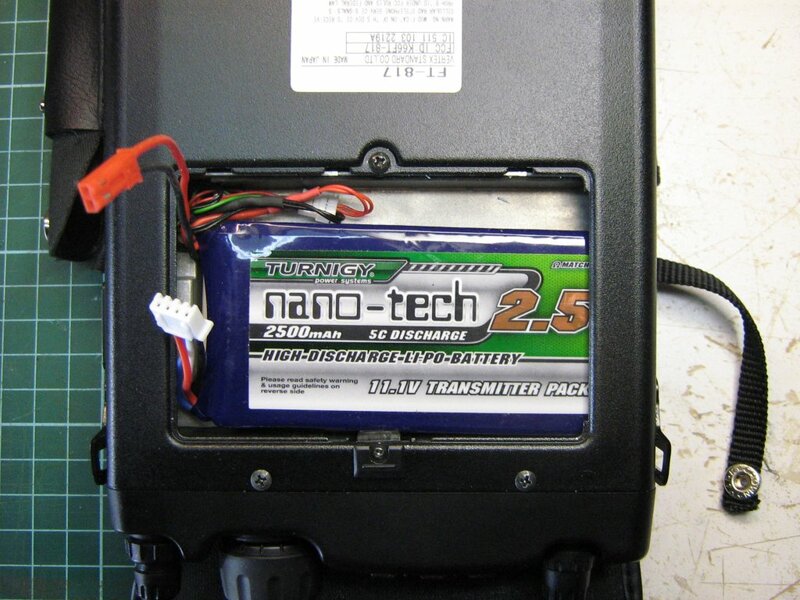 Update 2013-02-05: Just to be clear, most of the charging of the battery inside the FT817 is done with a balance charger. 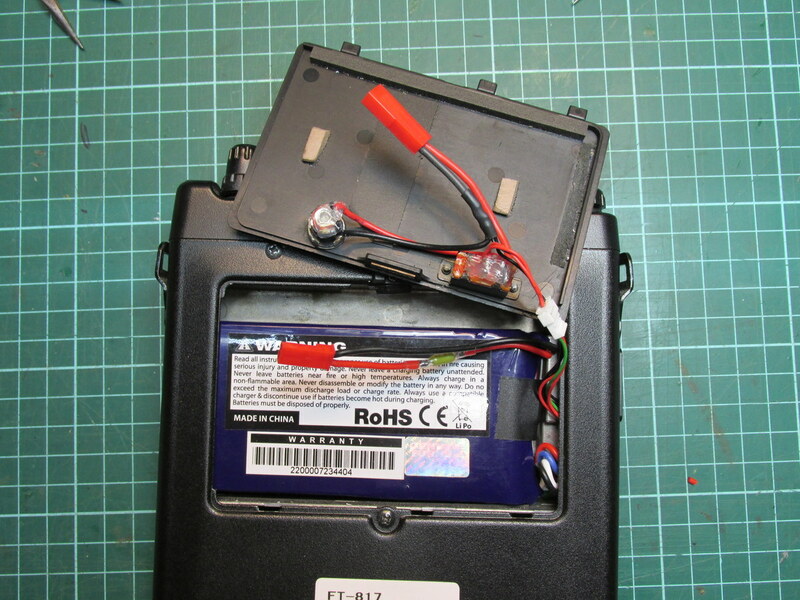 The battery flap is opened and the balance charger connected to the flying lead from the battery. 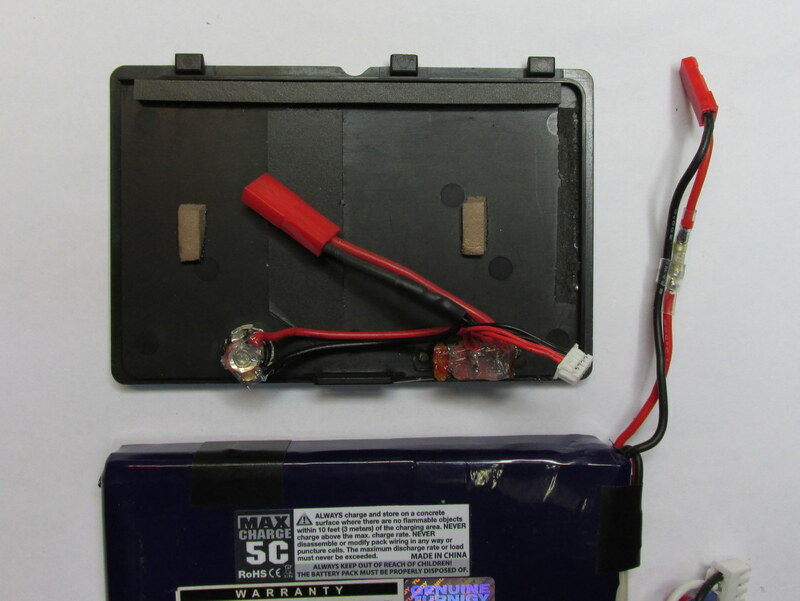 On occasion, the battery is charged from the DC connector (in the field for example), but the majority of charges are done using a balance charger. I have not noticed an imbalance in the battery after several non balance charges, but strongly recommend balance charging most of the time. This is consistent with my experience using RC Lipo batteries over the past 7 years or so. Out of interest, I did a capacity test on a new 2500mAh battery to see how honest the stated capacity was. I know that it does last a long time in the radio. 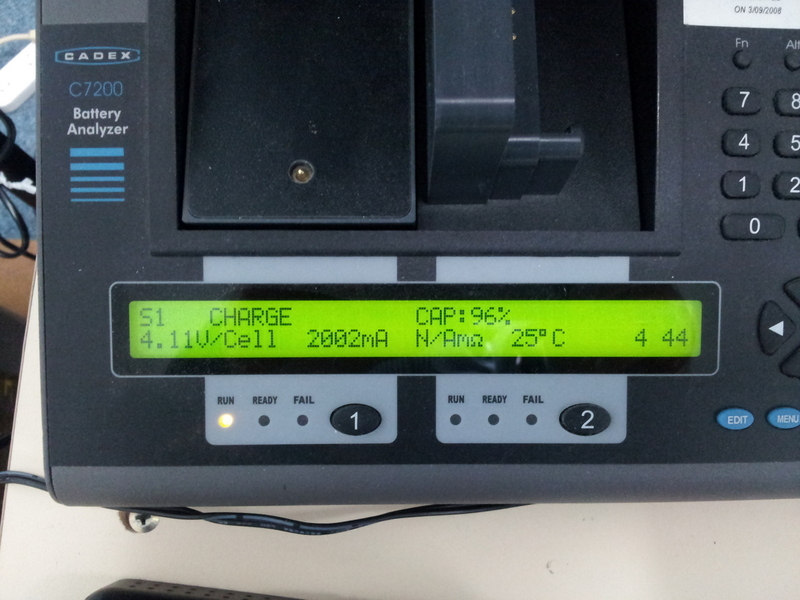 At my work, we have a Cadex 7200 battery analyser. It was set up for a 1 Amp discharge and then let run. To my surprise, the analyser reported a 96% capacity result scaled to 2500mAh. That is pretty good, as many of the cheaper batteries are far less than their labelled capacity. This entry was posted in Projects, radio communications. Bookmark the permalink. I’m new to lithium batteries. I understand you have the flying leads for balanced charging, and there appears to be 2 pin connector for using the battery. How have you attached this to the 817 inside? Did you have to modify the 817 at all? Also is that a fuse or a diode you’ve put inline on the battery? Sorry, its not too clear to me from the pictures. Yes it would probably work when fully charged, but as the discharge voltage is around 2.5-2.8 for an LiFePO4 cell, it would go below the minimum operating voltage for the 817 as the battery discharged. 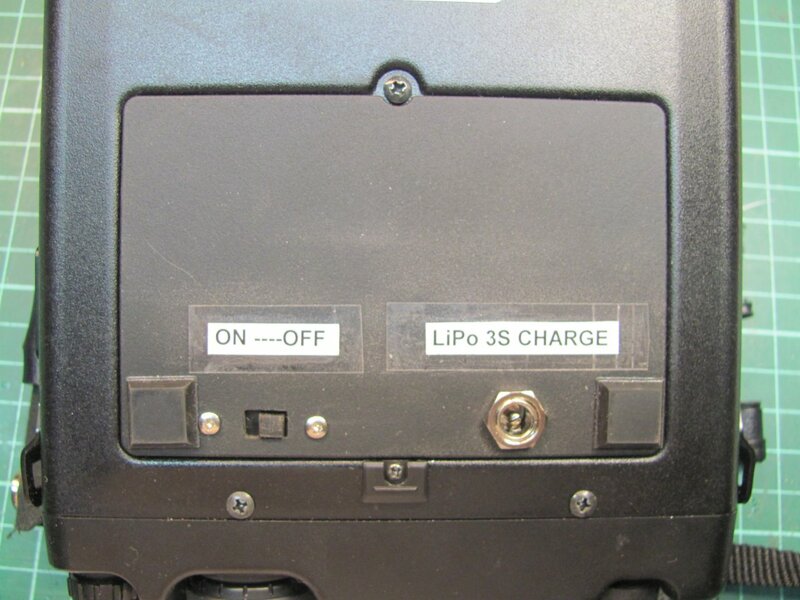 The plug on the radio side for the battery is in series with a slide switch and then connected to an 817 power connector that was taken from an AA pack holder. I think I understand. I’m not too concerned with the door modification at the moment, just using the battery internally and opening up to disconnect. I’m still a little unclear as to whether it’s plug and play or if I’d need to modify the battery connector on the battery it’s self. Clearly, the addition of a fuse is still a good idea though! You will have to replace the connector on the battery Alan. It’s not quite plug and play. The fuse or polyswitch is important, you don’t want to damage the radio or worse if things go wrong! Hi Rod, I dont think you will fit Anderson Power Poles in the tiny space between the battery and the side wall. The reason that JST connectors were chosen was purely lack of space. Anyway, they have survived a goat’s worth of activations. Cheers! Instead of PowerPoles I have found that XT60’s will fit in the compartment. OK XT60s are good connectors, I use them on my RC equipment. I just ditched the internal battery and used a 5Ah Lipo externally. Seems to have worked well for the last 4 years. I put Anderson Powerpoles on the battery and power lead. Using a 5Ah LiPo I can run the full 5 watts for quite a while when out portable. I did have a 4s LiFePo4, it Worked well, but it swelled up and I got shot of it quickly! The Cheap Chinese 3s has been brilliant. Perhaps I have just been lucky with the 11.1v LiPo. Nice idea for “upgrading” the FT-817ND’s power pack for a SOTA day out! So; purchased a couple of the LiPo batts & charger you describe above ……………… found the 4 wire charge (balance charge) lead & the two wire discharge (power output) lead – but I’m left with a two wire tiny white connector and two wire lead that seems to be ‘something else’ – what’s that one about’ and where does it connect to/do? 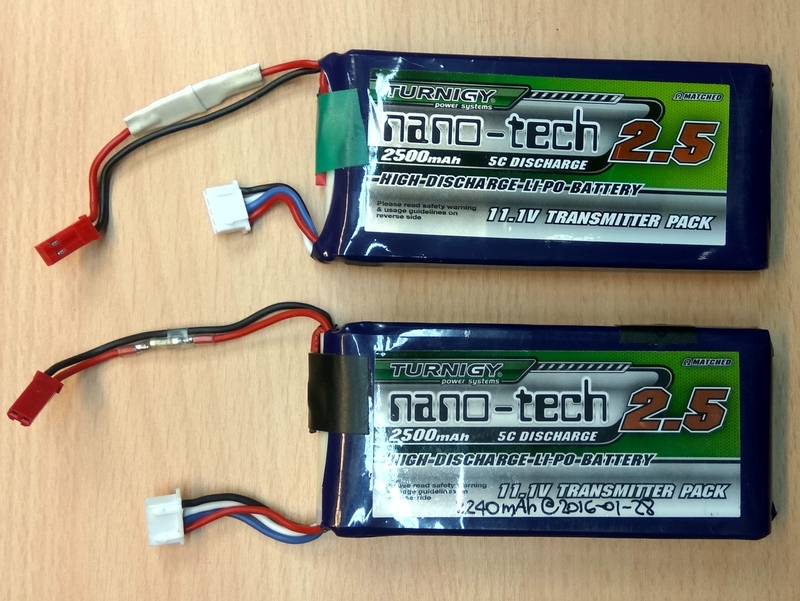 These LiPo’s are new to me and I’m still learning – Sorry to be so diM! Richard. G8ITB. Hi Richard, from memory the battery comes with a 4 wire balance lead, a black header style plug and a white plug. I cut off the white plug and put heatshrink over the ends and taped it. The black header plug was cut off also, and the wires terminated in a two pin JST socket with a fuse in the positive lead. The connecting JST plug then goes to switch and 817 power plug female. If I remember, I will post a photo of the battery and wiring. I just put the two black in parallel and the two red in parallel so that there is one positive and one negative. Cheers. Thanks! and lastly, what specs are required for the Polyswitch? I cant find the spec sheet for the device at the moment, but think it has a 3 Amp hold current. I will search some more. The Polyswitch is a Littlefuse LRF380F which has a 3.8 amp hold current. LRF380F ? dont think thats correct, no record of such a fuse anywhere m8. i think the Vishay MFU0805FF03150P100 3.15 amp fuse should do it though.